I nice 100KMs clocked up this week, that takes me to 500.2KM this year. Am happy about that – feeling good on the bike already, the legs haven’t completely forgotten everything it seems. Training for last years Ridelondon was pretty hard work. It takes a lot of effort to drag yourself out each week and cover the distance as a solo rider. I spent many many hours just me and the bike, going over similar routes in all weather just to get the time in the saddle so I could cover the distance. Its so easy to find excuses to cheat on the distance or time you have done, or make yourself “go up that hill again”. It is much better to try and find people to ride with. Having a group of riders gives you a load of benefits. You get some protection against the traffic. It is a great motivator to get out. (you don’t want to be the one to no show). You learn skills to ride safely in a big group. Typical club activities are shown in this video. New 2014 Route is posted. News this week – The 2014 Ridelondon 100 route has been posted. 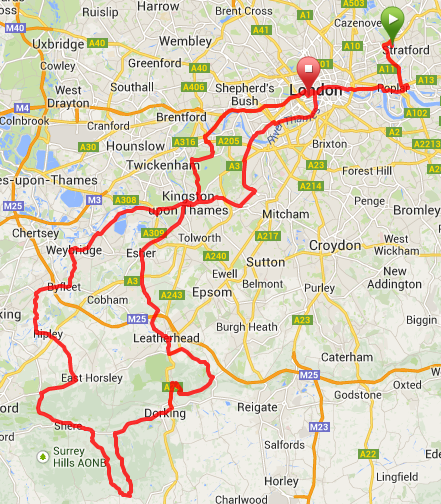 A few subtle changes, but the main bulk of the route is pretty much the same as last year. Out of Leatherhead there is a cross country route to Esher via Oxshott (rather than the main road) which should be a nicer route. Some changes around Kingston on the way back, routing through the town centre. New route available for Garmin devices here…. Weather Improves – time to get out. The weather has been kind the past week, so at last a chance to get out for some miles. 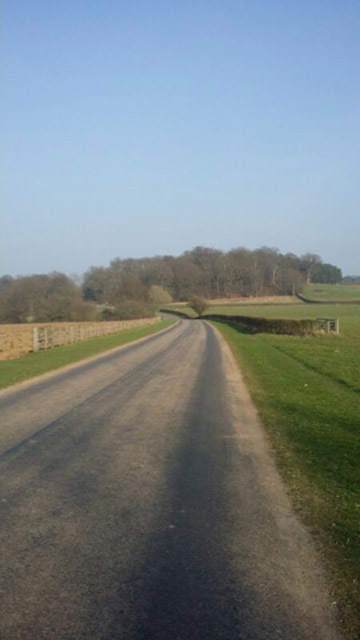 I took the bike on a nostalgic tour of Windsor Great Park. This is where I did a lot of my mileage getting ready for last years RideLondon 2013. The temperature was even hot enough for shorts, and I blasted a few laps of the park stopping to check out the views over Windsor and the Lake. I gentle spin home clocked me up 40km. Its my road.. all to myself. Sunday I did a longer ride into the Surrey hills a nice loop on the hottest day of the year so far. A 100km beautiful ride taking in some climbs and a few sprints to mix up the legs. I stopped off at a farmers market near Godalming for a coffee and cake to fuel me for the return journey. I felt ok after this 60mile ride. My legs took a day to recover but I feel good that I can ride this distance “comfortably” this early in the year. Spring has arrived this week, with the temperature promising to be a balmy 14 degrees, I took a gamble and shot out after work to head down to the Surrey Hills. The legs were suffering as I confess I had larded it up over Christmas and its been a while. The run from Pyford to Ripley was a complete bonus !!. They are repairing 3 of the small bridges that got trashed with the floods earlier this year. This means the road is closed to traffic (but not for pedestrians and cycles) This makes for a very nice couple of miles with “closed roads”. If you get a chance to get on them (its on the 2012 Olympic route) you have about a month or two before they finish the work. I got up to the top of the downs via Staple Lane, and had a quick 5min break to admire the view. There was a bit of a haze over the main towns of Woking and Guildford, but it was completely clear out towards the smaller villages. It was a nice ride back as the sun was setting, the temperature dropping all the time. All in all a nice round trip of some 65km. Club ride with Woking CC on Sunday.